Are you having breathing problems when taking a long walk? Do traffic jams make the condition worse? Well, these are the symptoms of asthma. You may be physically and mentally fit but then, you may also be suffering from health problems. Asthma is a chronic disease through which breathing passages of lungs are affected most. Asthma is caused due to the inflammation of these passages. 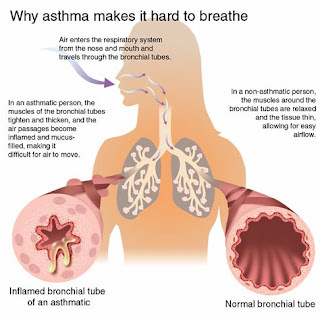 Asthma is a long term lung disease that causes the inflammation and is responsible for the narrowness of air pipe. Asthma causes the problem while breathing which results in a whistling sound when you breathe. This is generally accompanied with tightness in chest, coughing that often increases at night or early in morning. Asthma can attack any age but children are attacked by it most often. Asthma is responsible for the swelling of airways and this makes them very sensitive. Muscles get tightened up and thus less air is allowed to rush in. Hence, asthma patients find it harder to breathe. The symptoms of asthma are seen every time airways get irritated. Correct causes of asthma are not known up till now. Different researchers have different views. Genetic problems or hereditary can also force you to suffer from asthma. Besides this, respiratory problems in childhood can result in asthma. Some people are born with asthma. Environment in which you live also plays an important role. Persons living in polluted area are more prone to asthma. Asthma can attack anyone but children are usually at risks. Boys are more prone to asthma than girls but considering the case of adults, women are at more risk than men. Asthma is developed as a result of some allergies or inherited by parents who have asthma. Emission of certain chemical irritants or industrial dusts also can contribute in leading someone to asthma and deteriorating your health. Early diagnose of asthma can help in best health advice of making the situation a little better. Have the medicines daily as direct by your physician. Get weekly check ups for your asthma. Stay away from polluted environment. When stuck in traffic jam, put a handkerchief on your mouth to prevent any allergic to enter airways. 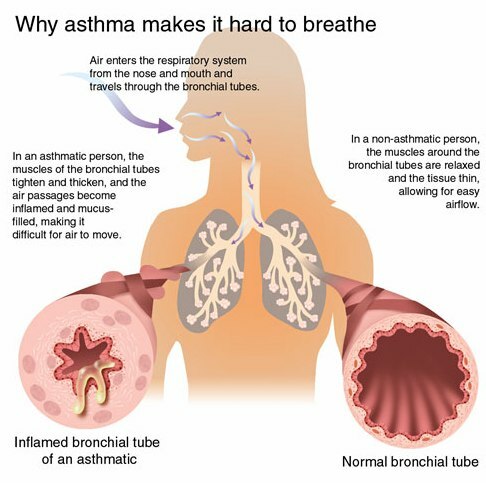 Asthma restricts the normal living of person. Sufferers from asthma have to have to pay attention on their health for proper well being. Compromises in life style to accommodate the disease are required. One should stay away from smoking and other such addictions.